You don’t have to drive to the Caldera to see elk in New Mexico, obviously. We’ve seen plenty of them near Taos. They’re all over the place in the mountains. Sometimes they stand in the roadway after dark enjoying the warm pavement. This makes driving at night or in the evening especially exciting. Those things are big, in case you hadn’t noticed—bulls stand five feet at the shoulder and weigh over 700 pounds! 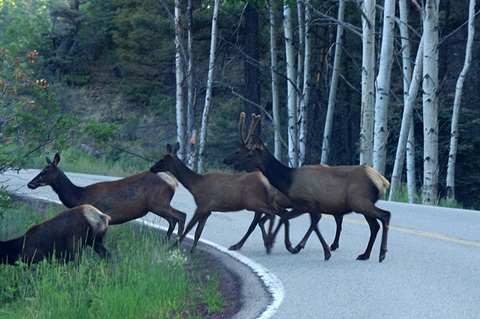 A few years ago we nearly collided with a small group of elk crossing the highway just over Flechado Pass. I barely got the car stopped in time but did have my DSLR ready and caught the last of them! To this day my wife shudders at the thought of taking that road after dark. We’re about to do it again though, with me driving of course, to hear Chick Corea play in Angel Fire. He’s even older than I am. I don’t know how much more excitement I can stand. Go, man! Hell, if that doesn’t work, we’ll take away his glasses and make him drive. In about 1982 my wife-at-the-time and I were driving on a dirt road near Jack’s Camp in the Pecos Wilderness about 20 miles north of Pecos, NM and rounded a curve and saw a herd of elk right beside the road. That was the only time I ever saw an elk in the wild. That’s how it often happens! There are also places where one has a good chance of seeing some, regardless, like just over Bobcat Pass from Red River, or at the Valles Caldera, and elsewhere. They have reintroduced Elk in to the Smokies back here in Tennessee. Saw them on a bike trip up over the mountains to Cherokee,NC. a few days back. They were wandering the road like they owned the place! Something to add to the list of wild life I see on the bike trips. They do kinda own a place when they get there, don’t they? I had no idea Tennessee was doing that! Great idea, though. In the summer of ’86 or ’87, I was hiking southeast of Oregon’s Crater Lake and heard the sound of lots of brush being pushed aside. I immediately got close to a large cedar in time to watch a herd of about 20 Roosevelt Elk of medium to large size go past me at a good clip. My camera was tucked away, so I didn’t get a picture, but I certainly got a thrill at being so close to so many at one time! What a great story. I know one fellow who found himself suddenly surrounded by grazing elk in Olympic National Park. He sat down on the ground and they walked all around him, didn’t seem to notice. How weird is that?